The Crystal City Business Improvement District has a hit on its hands with its recently revamped weekly event Fridays at the Fountain. The seasonal, outdoor event is more popular than ever and its schedule has been extended this year. Last year Fridays at the Fountain was called “Wine in the Water Park” — it’s held at the Crystal City Water Park — and was held every Friday evening in June and September. It attracted a loyal following because it’s a great way to unwind after a long week: a local shop provides beer and wine for purchase while local musicians provide live music. However, frequent attendees of the event began to request that BID make changes. They wanted it to run throughout the summer and into the fall, while the weather was still relatively comfortable. They also suggested that the event start earlier, so that it could be a happy hour for people after they left work. This year, BID took those suggestions and also renamed the event. 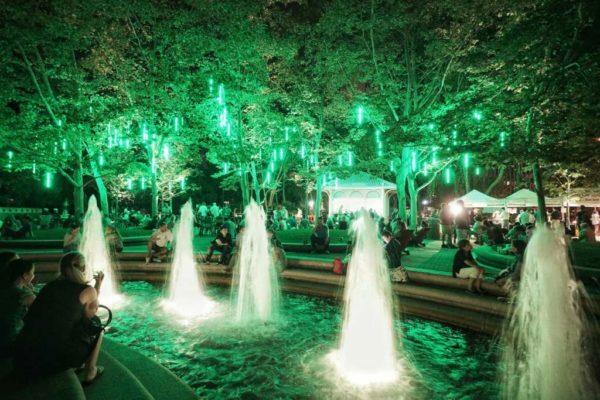 The event series is now held from June through October, from 5 to 9 p.m. And Fox explained that it is now called “Fridays at the Fountain” to better reflect the venue — the word “water park,” after all, conjures images of waterslides and lazy rivers, not the relaxing water features that the park actually has. The changes had the desired effect. “Attendance for the event, especially when it’s beautiful out, has been phenomenal,” Fox said. The BID, an ARLnow.com client, also leveraged its advertising relationship with the site to grow attendance this year. Back in May, the BID ran a sponsored “Deal of the Day” feature with ARLnow.com to introduce the renamed event and to promote tickets for it. Robert Mandle, the chief operating officer for BID, said that the post sold a whopping 1,500 drink tickets and also helped to boost overall awareness of the rebranding. “The daily deal was a great way to raise awareness about the rebranded event and seed the summer attendance with a lot of tickets in circulation,” Mandle said. Fox said the promotion helped sell way more tickets than BID had anticipated. “I think what it showcased to us is how many people are paying attention to ARLnow, which is one of our favorite advertising partners,” Fox said. The Deal of the Day post is offered at a low fixed price. ARLnow does not take a cut of the deal revenue, thus allowing clients to offer more compelling discounts and experience a greater return on investment.